Don’t let people determine your worth based solely on their experiences or lack thereof. Don’t let people make you feel like you need to compete with them. Even before I was ever called Super Woman, there were always people who felt like they could tear me down with their own insecurities. They would try to damage my self-esteem, determine my value, tell me what I couldn’t do and what I’d never do. I thank God for the strength and empowering words and gifts from my grandparents that were instilled in me so deeply that I never fell too deep into what other people thought of me or wished of me, that I couldn’t come back to the surface. Even to this day, people still try it. I’ve had people smile in my face and lie on me behind my back. I’ve had people try to associate with me to improve their own self-worth and when their plans failed, they tried to curse me in the name of God. I couldn’t make this up if I wanted to. People claim they don’t like The FabLife Radio Show. But they don’t have a radio show, never had one and wouldn’t know what to do with one if they did. I don’t care, as long as people continue listen. Them listening to a show they claim they don’t like is giving me ratings (smile). If they don’t listen, I don’t care about their opinion because I know that it comes from a place of prejudice. 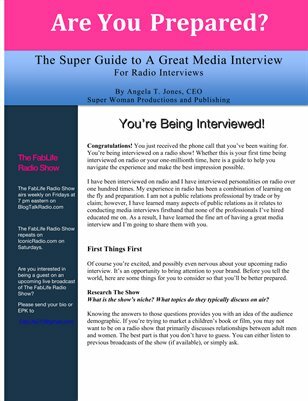 I’ve had over 50 celebrity and subject matter experts just in the first year of broadcasting the show. We constantly have people email us requesting to be guests on the show. I must be doing something right. People claim they don’t like FabLife Apparel and Accessories, yet they’ve never seen it. They try to say it’s never going to sale and no one is going to buy it. Well people have bought it, even before a single print ad or commercial has been seen publicly. Those people bought it because they like what it stands for and when they wear their shirts, they wear them proudly. Now when the doubters and haters see a celebrity walk down the street wearing one, they will all will want one, too. That will be coming soon. Some people don’t believe in me. Some people dislike me and yet they have never met me. Many of you have the same experiences on a daily basis; at work, at school, even from relatives. Being a public figure doesn’t change that, it just exacerbates it because it’s thousands more people looking at you everyday. That in part is why I’m not too quick to be in public all the time. I never wanted to be a celebrity and I’m not keen on that word being used to describe me. I’m intelligent enough to know that I can only control that to a certain degree. The more successful I become, the more likely the word “celebrity” is going to be used to describe me. At the end of the day, it doesn’t matter what people call me, as long as they have the respect enough to spell my name right. I realized awhile back that many of my experiences growing up and in the first 20 years of my adult life were a form of boot camp to prepare me for what I deal with now and will deal with as the Super Woman Brand grows. My own ambitious nature will not allow me to ever stop striving to be successful and help others. Therefore, I needed to have a coat of armor to protect me from what the world likes to dish out. As much as there are some things about my changing lifestyle I don’t much want to deal with or have caused inconveniences, I realize they are necessary. At least I didn’t wake up in the lifestyle completely unprepared and naive to it. I was gradually introduced to it and educated it on by those with more experience than myself. I was able to observe it from a realistic standpoint for a number of years before it because a part of my day-to-day experiences. I didn’t ask for any of it, but it’s the Master’s Plan for my life. If I try to fight it, I will only lose. If I embrace it, I will always be happy. While others are doubting me, lying on me, trying to discourage others from supporting me, opportunities are getting bigger and better. The Super Woman Brand is embarking on a publishing project that will allow writers in Detroit to become published in early 2014. We’ve entered into a business relationship with Live Nation, the largest concert and venue promotion company in the entire world. We’re going to travel to other states and broadcast The FabLife Radio Show while there. We’re shooting commercials and print ads for FabLife Apparel and Accessories. We’re sponsoring and producing events in early 2014. We’re expanding our business services and our national reach. We’ve already lined up our signature events for 2014, including our official International Women’s Day event in March, our I Feel Good! Mind, Body and Soul Women’s Conference in August and so much more that I get dizzy trying to remember it all. This year I was awarded the 2013 Confident Woman Award, I was recognized in the seventh edition of Who’s Who in Black Detroit. These acknowledgements indicate that I’m doing something right. While other organizations and publications honor and acknowledge the same people year after year after year, it is the smaller publications that I respect and appreciate most because they are the ones that take the time to actually seek people others may not know about yet, who are doing great things in the world. Like yours truly. This year for the first time I went from inside the pages of magazines, to being on the cover of one; Detroit CEO Magazine’s first print edition includes myself, Lacretia Rogers and Mahogany Mignon. If by chance you don’t know who they are, I encourage you to research them further. The magazine will be available to buy soon and details about the event will be shared with Super Fans. I don’t do what I do for “likes”, I do what I do because I love it. My work fulfills me as an individual, it heightens my purpose in this world. I don’t have to compete with anyone. I am my only competition. My goal is to be better each day than I was the day before. No one can diminish that, make me doubt myself for that, make me quit or make my hurt, because I choose to live my life with purpose. It may be a purpose they don’t like or understand, but that is not my concern or problem to solve. Those who have been supportive of me for the last five years will still be five, ten or fifty years from now for the same reasons. What happened to all of the people who tried to damage my self-esteem, determine my value, tell me what I couldn’t do and what I’d never do? Some of them are dead, some of them are still poor, some of them still haven’t done anything with their own lives, some of them are miserable. Had those people spent more time improving themselves, reaching their goals, competing with themselves instead of criticizing others, they too, could have accomplished much more. Life is too short to concentrate on others more than you concentrate on yourself. Life is too short to spend it talking about others and not reaching for your personal greatness.